The Red Sox kicked off their spring game schedule yesterday with a doubleheader sweep of Northeastern University and Boston College. Dan Butler and Shannon Wilkerson each hit two-run homers in the Red Sox 11-1 victory over BC. Xander Bogaerts and Jackie Bradley Jr. (pictured) each also added a hit against the Eagles. In the Northeastern contest, Jose Iglesias, Pedro Ciriaco and Jarrod Saltalamacchia drove in a run apeice to lead the team to a 3-0 victory. Terry Doyle, a BC alum, tossed a pair of scoreless innings against his alma mater, but the most important moment of his appearance was when Peter Frates, his former team captain now fighting ALS, was wheeled out to deliver Doyle the game ball. Doyle, a local product raised in Salem, NH, is excited to be getting a chance to make it to the big leagues with his hometown team, writes Gordon Edes of ESPNBoston. Baseball America released its 2013 list of their top 100 prospects. Bogaerts ranked eighth, Bradley 31st, Matt Barnes 40th, Allen Webster 49th, and Henry Owens 91st. In a chat after the list was released John Manuel indicated that Blake Swihart was one of the players who narrowly missed the cut. Looking to add to their depth, the Red Sox acquired first baseman Mike Carp from the Seattle Mariners on Wednesday for a player to be named later or cash. The 26-year-old Carp had been designated for assignment by the Mariners after hitting .213/312/.654 with five home runs and 20 RBI in 59 games in 2012. Carp is out of options and will likely serve as left-handed hitting depth for the Red Sox. The Carp acquisition left questions about the status of Lyle Overbay, who signed with the Red Sox at the end of January. Overbay told Mike Petraglia of WEEI.com that the new competition is "no big deal" and he is looking forward to winning a roster spot. To make room for Carp on the 40-man roster, Ryan Kalish was placed on the 60-day disabled list. The PawSox announced this week that Jeff Levering will be their new radio broadcaster. Levering replaces Aaron Goldsmith who was named the radio voice of the Seattle Mariners in January. 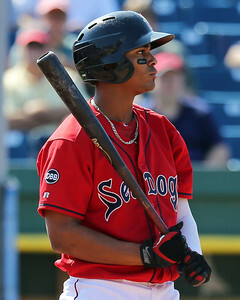 Top prospect Xander Bogaerts (pictured) will be leaving this week for the World Baseball Classic. A shortstop regularly, he will be playing third base for the Netherlands team in deference to Braves shortstop Andrelton Simmons. In preparation for the move, Bogaerts has been taking reps at third base in Red Sox camp, as Peter Abraham of The Boston Globe reports. To get perspective, Tim Britton of The Providence Journal interviewed Will Middlebrooks and Garin Cecchini, both of whom previously made the same transition. Middlebrooks’ take? “He's a lot better than I was, so it probably won't be that hard. He's a stud." The meteoric rise of Bogaerts, from his first Fort Myers workout in 2009 to his current status as phenom, was traced in this excellent profile by Alex Speier of WEEI.com. At MLB.com, Ian Browne looks in at Sox camp, where top prospects Bogaerts and Jackie Bradley, Jr. are standing out. Scott Lauber of the Boston Herald reports on those two, as well as shortstop Deven Marrero, taking part in their first major league spring training. Bradley was interviewed by Sam Dykstra for MLB.com. One of the highlights is the discussion of Bradley’s “power shagging” routine in outfield warmups. He also stopped by the Dennis and Callahan morning show on WEEI, where topics included preparing for the grind of the long season, and his approach at the plate. The Red Sox have signed right-handed pitcher Rey Cotilla and lefty Sean Henn, reports Matt Eddy of Baseball America. Cotilla is a sidearmer who was drafted three times (by Pittsburgh in 2007, Kansas City in 2008, and Milwaukee in 2009) but did not sign. He split 2012 between Joliet of the Frontier League and Rio Grande Valley of the North American League, where he had a a 4.76 ERA and 15 striketouts in 17 innings pitched. Henn, 31, was originally signed by the Yankees. He appeared in 60 major league games between 2005 and 2009, posting a 7.56 ERA in 81 innings. Our own Jonathan Singer confirmed several international signings. The most notable were Venezuelan twin brothers Luis Alejandro Basabe, a second baseman, and Luis Alexander Basabe, who playes centerfield. Both received a signing bonus of $450,000. Also signed were center fielder Raiwinson Lameda, first basman/outfielder Darwin Pena, outfielder Franklin Guzman and right-hander Carlos Caceres. Rubby De La Rosa will be limited to two innings per appearance this spring as he continues to recover from Tommy John surgery, per Tim Britton. Lost in much of the discussion of this offseason’s Joel Hanrahan trade was the acquisition of Brock Holt as part of the deal. Edes provides an introduction to the middle infielder. Of all the players in big league camp, only Jonathan Diaz has been part of one run by new manager John Farrell. Britton interviews Diaz, signed in December as a minor league free agent, about the experience. Be sure to continue to check in to our Prospect Previews, as SoxProspects.com Director of Scouting Chris Mellen details the upcoming season for all of the top prospects in the system. James Dunne and John Gray are Staff Writers for SoxProspects.com. Follow James on Twitter @JamesMDunne. Follow John on Twitter @JohnRGray.